As far as big tech companies go, Zoho is a bit different. Not only has it never taken any venture funding, it also offers more than 40 products that range from its online office suite to CRM and HR tools, email, workflow automation services, video conferencing, a bug tracker and everything in-between. You don’t often hear about it, but the company has more than 45 million users worldwide and offices in the U.S., Netherlands, Singapore, Dubai, Yokohama and Beijing — and it owns its data centers, too. 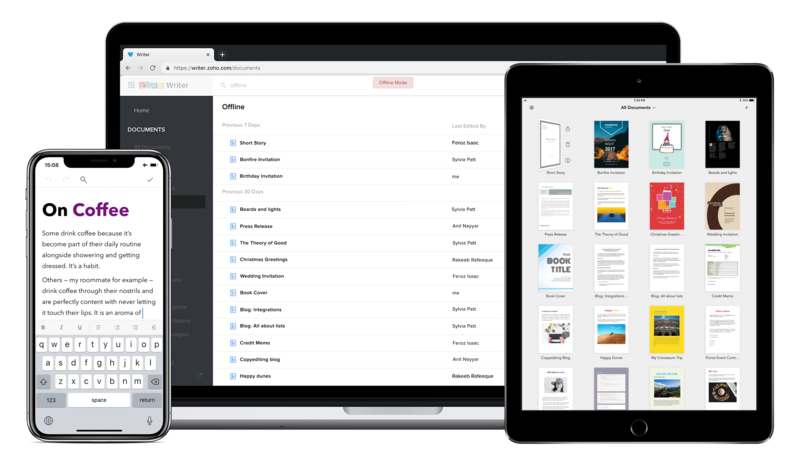 Today, Zoho is launching a major update to its core office suite products: Zoho Writer, Sheet, Show and Notebooks. These tools are getting an infusion of AI — under Zoho’s “Zia” brand — as well as new AppleTV and Android integrations and more. All of the tools are getting some kind of AI-based feature or another, but they are also getting support for Zia Voice, Zoho’s conversational AI assistant. With this, you can now ask questions about data in your spreadsheets, for example, and Zia will create charts and even pivot tables for you. Similarly, Zoho is using Zia in its document editor and presentation tools to provide better grammar and spellchecking tools (and it’ll now offer a readability score and tips for improving your text). In Zoho Notebook, the note-taking application that is also the company’s newest app, Zia can help users create different formats for their note cards based on the content (text, photo, audio, checklist, sketch, etc.). “We want to make AI helpful in a very contextual manner for a specific application,” Raju Vegesna, Zoho’s chief evangelist, told me. “Because we do AI across the board, we learned a lot and were are able to apply learnings on one technology and one piece of context and apply that to another.” Zoho first brought Zia to its business intelligence app, for example, and now it’s essentially bringing the same capabilities to its spreadsheet app, too. It’s worth noting that Google and Microsoft are doing similar things with their productivity apps, too, of course. Zoho, however, argues that it offers a far wider range of applications — and its stated mission is that you should be able to run your entire business on its platform. And the plan is to bring some form of AI to all of them. “Fast-forward a few months and [our AI grammar and spellchecker] is applied to the business application context — maybe a support agent responding to a customer ticket can use this technology to make sure there are no typos in those responses,” Vegesna said. There are plenty of other updates in this release, too. Zoho Show now works with AppleTV-enabled devices for example, and Android users can now use their phones as a smart remote for Show. Zoho Sheet now lets you build custom functions and scripts and Zoho Writer’s web, mobile and iPad versions can now work completely offline. The broader context here, though, is that Zoho, with its ridiculously broad product portfolio, is playing a long game. The company has no interest in going public. But it also knows that it’s going up against companies like Google and Microsoft. “Vertical integration is not something that you see in our industry,” said Vegesna. “Companies are in that quick mode of getting traction, sell or go public. We are looking at it in the 10 to 20-year time frame. To really win that game, you need to make these serious investments in the market. The improvements you are seeing here are at the surface level. But we don’t see ourselves as a software company. We see ourselves as a technology company.” And to build up these capabilities, Vegesna said, Zoho has invested hundreds of millions of dollars into its own data centers in the U.S., Europe and Asia, for example.